I really love onion rings, and if I had to pit a good onion ring against a good french fry... well it would be a hard decision. But the problem with onion rings is that so often the are sub par and disappointing. Either the breading is too thick, the onions are too thick or thin, or the onion is undercooked. Biting into a crispy piece of breading only to be met with raw onion is the worst. For several years now I have been wanting to make onion rings at home. And while I have recently become more comfortable with frying (as in, I'm not afraid I'm going to burn my house down comfortable, not I think it's great and healthy and I do it all the time comfortable), I would still prefer a baked version if it lives up to the classic fried onion ring. Leave it to Cook's Illustrated to come up with just that. After experimenting with dozens of coatings, they settled on a combination of potato chips + saltines. Since the chips have been fried, they give the onion rings that deep-fried taste, but without the mess. The saltines help absorb the grease from the chips, as well as give the onion rings a nice salty kick. Other than that, you have a pretty basic dredging technique, and the onions are baked to crispy perfection. Even though these are baked instead of fried, they are admittedly still not healthy. But who eats onion rings to be healthy anyway? Adjust the oven racks to the lower-middle and upper-middle positions and preheat the oven to 450 degrees. In a shallow baking dish, spread 1/4 cup of the flour. In another shallow dish, whisk together the egg, buttermilk, remaining 1/4 cup flour, cayenne, paprika, 1/2 tsp salt, and 1/4 tsp pepper. Pulse the chips and saltines in the food processor until finely ground. Spread the crumbs in a third shallow baking dish. Slice the onions into 1/2-inch thick rounds. Separate the rings, and discard any rings smaller than 2 inches in diameter. Pour 3 tablespoons of oil onto each of 2 rimmed baking sheets. Place the sheets in the oven and heat until just smoking, about 8 minutes. Meanwhile, prep the onion rings. Working 1 at a time, dredge each onion ring in flour, shaking off the excess. Dip the rings in he buttermilk mixture, and allow the excess to drip back into the dish (I used a fork for this step, and it worked wonderfully). Drop the onions in the crumb mixture, turning rings to coat evenly. Transfer the coated rings to a large platter or baking sheet. Remove the baking sheets from the oven and carefully tilt them to coat evenly with the oil. Arrange the onions in a single layer on the sheets. Bake, flipping he onion rings and switching and rotating the position of the sheets halfway through baking, until golden-brown on both sides, about 15 minutes. Briefly drain the onion rings on paper towels before serving. What an interesting type of breading. I never would have come up with that. 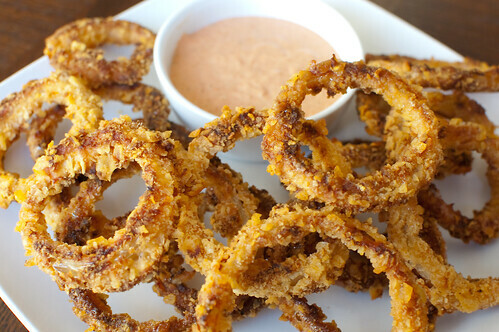 I love onion rings but I'm not into wasting all the oil frying - I love this alternative! Potato chip breading is brilliant! Potato chips and saltines....I would never guessed. Can't wait to make these! These look great! I have actually been brainstorming the classic "blooming" onion! YUM! What a clever way to make onion rings! I just made these too, but without the "fried" coating... http://ringr.wordpress.com/2011/04/07/baked-onion-rings/ I think they would be awesome with the flavor of the frying (I'll keep this in mind for next time, although with the panko coating they were still quite amazing)!! Is the sauce mayo and bbq sauce? I always serve that with onion rings. Kind of fatty and gross, but only if you know the ingredients. Those look delicious. I will be giving those a try. SGM, no it is a mix of mayo, horseradish, and a bunch of spices. I think the mayo was just too overpowering for me. I'm not a fan of mayo, so I don't think I'd like it with BBQ sauce - I'm sure my husband would, though! that keeps the fried batter/dough crisp and crunchy for a long time -- it's apparently also the secret of street hawkers in Thailand with their plenty of fried crispy goods! Great recipe... love the saltines and potato chip addition... must be soooo crunchy good! Nice stopping by! YUUUUUUM!!!! This looks absolutely DIVINE! Why don't you have a printer friendly recipe so we don't have to print all the comments made? Anon, try selecting just the recipe and printing 'selection' from File, upper left corner. hilight the recipe then choose selection 0n the printing preview.